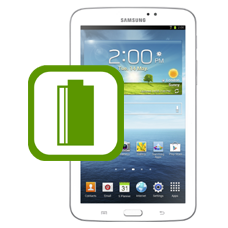 Does your Galaxy Tab 3 7.0 inch battery not last as long as you? Or has it been left uncharged for a long period of time and no matter how much you charge the Galaxy Tab 3 7.0 battery it will not fully charge or still remains dead? If this is the case allow our expert technicians to fit a genuine Samsung Galaxy Tab 3 7.0 battery to your unit, the battery will be fully tested with a complete charge cycle, then return shipped back to you using our insured express delivery service. This is an in-house Galaxy Tab 3 7.0 repair service, when ordering this service you are required to ship the phone into our repair centre for works to be undertaken. I have signs of battery damage can you help? If your tablet battery is not performing as expect, our in house Galaxy Tab 3 battery replacement service replaces your old worn out battery with a new genuine Samsung replacement battery.